Our first sight of Icelandic behemoth Sigur Rós is in silhouette. The trio – bassist Georg Hólm, drummer Orri Páll Dýrason, and guitarist/vocalist Jónsi Birgisson – are framed against a wall of swimming colours and writhing shapes, surrounded by a mesh of neon tubing which pulses in tempo with the ethereal post-rock soundscapes. 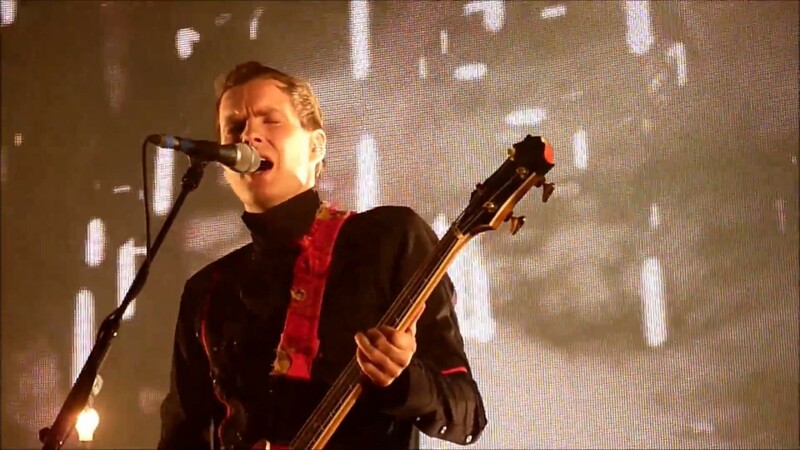 While visually stunning, the whole performance undeniably centres around frontman Jónsi’s unique vocals. Not a word of English is sung on-stage, as the band’s material consists of their native Icelandic and Jónsi’s own semi-improvised “Hopelandic”. Thus, the emotion is carried not so much through lyrics as through his sheer vocal range; his voice travelling between crackling falsetto and sweeping, breathy lows instantaneously. At one point, in an almost operatic show of skill, Jónsi holds a single ghost note for a painfully long stretch, eliciting several misguided bouts of applause along the way. Honestly, it’s any wonder he doesn’t burst a lung. The setlist itself spans the band’s entire career, from early albums Ágætis Byrjun and Takk… to their recent, darker output on Kveikur – with a standout being the melancholy ‘Untitled 2’ from their similarly ambiguously titled third album ( ). There are audible grumbles from the crowd as we shuffle out regarding a certain omission; a number miffed at the lack of the band’s breakout hit, ‘Hopipolla’. But while the absent track is undoubtedly their most well-recognised, and likely the reason for a large section of the audience’s presence, perhaps its omission was deliberate, given the harsher territory the band now occupies. Regardless, with a barrage of sight, sound and colour, in its place Sigur Rós deliver a more surprising and emotive experience than a sole fixation on past glory could provide.